From The NY Times. In the picture, The Rev. Kathy Brearley was among those testifying before a House committee. Her son Owen Thomas, a college football player, already had brain damage when he committed suicide in April. 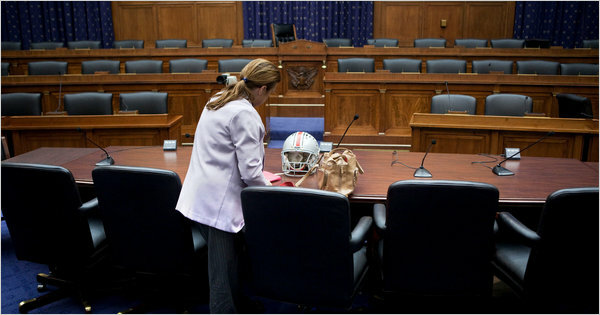 WASHINGTON — Congressional interest in legislation to protect young athletes from the effects of concussions has become so spirited that on Thursday morning one House committee held a hearing on one bill at the same moment another committee passed a different bill just 400 feet down the hall. Both pieces of legislation address youth sports concussions, but in different ways that could determine whether they become federal law. The House Energy and Commerce Committee bill, known as the Concussion Treatment and Care Tools Act, or the Contact Act, was officially polished for a vote on the House floor, possibly next week. The bill calls for the secretary of health and human services, Kathleen Sebelius, to convene experts who would recommend nationwide guidelines for managing concussions in athletes in all sports ages 5 to 18, including the decision of when a concussed athlete can return to a sport. It also allows for federal grants to states for putting policies and safeguards in place. Meanwhile, the House Education and Labor Committee held its second hearing on the more recent Protecting Student Athletes From Concussions Act, listening to testimony from five experts on youth concussions and their possible consequences. Its bill would require public school districts to develop and put in place their own plans for sports concussion management, would explicitly require that any athlete suspected of concussion must be removed from play until cleared by an appropriate health-care professional, and calls for special scholastic services for athletes in recovery. “We need to approach this in as many ways as we possibly can,” the Rev. Kathy Brearley testified before the Education and Labor Committee. Researchers recently discovered that Brearley’s son, Owen Thomas, a 21-year-old lineman on the University of Pennsylvania football team, had developed progressive brain damage associated with head trauma before he committed suicide in April. The committee’s chairman, George Miller, Democrat of California, said that part of his rationale for sponsoring the bill was to bring some nationwide uniformity to policies that have been adopted or are being considered by more than a dozen states. Most have used Washington State’s law as a template, as did Miller’s bill. “Many states have taken action, but there is little regulation on the whole to ensure that students in every state will have the same minimum protections,” Miller said. Testimony focused on two aspects of young athletes’ concussions. First, such injuries occur in every contact sport involving boys or girls — for example, girls basketball follows football as the sport with the highest rate of brain injuries, according to research by Nationwide Children’s Hospital in Columbus, Ohio. Second, concussions, particularly if poorly managed, can seriously hamper academic performance for weeks or even months. Alison Conca-Cheng, a senior at Centennial High School in Ellicott City, Md., recounted her struggles with schoolwork after she sustained a concussion in a soccer scrimmage last month. Other witnesses were Dr. Stanley A. Herring, the team physician for the Seattle Seahawks, who helped shape Washington’s groundbreaking state law on concussion management; Dr. Gerry Gioia, chief of pediatric neuropsychology at Children’s National Medical Center in Washington, who has pioneered research into the academic consequences of youth concussions; and Sean Morey, who recently retired as an N.F.L. receiver and special-teams player and has assisted the league’s players union in its concussion-related policies. When Donald M. Payne, Democrat of New Jersey, noted that wealthy areas could afford doctors and athletic trainers while poor areas could not, Herring pointedly referred to the legislation’s lack of financial backing. The Contact Act, spearheaded by Bill Pascrell, Democrat of New Jersey, until recently earmarked millions of dollars to states to help school districts afford athletic trainers, neuropsychological testing and other measures. That money was removed in interparty negotiations to get the bill voted on by a full committee on Thursday. It passed unanimously. Pascrell said in an interview that the two bills could eventually be merged. But he said that the Education and Labor bill discussed Thursday, which calls for the federal government to set guidelines to which states must adhere, could be problematic for states-rights advocates. The next stages for the Contact Act are votes by the full House of Representatives and then the Senate, after which President Obama could sign it into law. Although the House might not vote on the bill before its lame-duck session in December — House votes will cease after next week as members of Congress hit the campaign trail before the midterm elections — the bill is expected to face relatively few obstacles because of its bipartisan, no-cost-yet focus on child safety.